I honestly wasn't so much of a fan of fruit in baking as the thought of cooked fruit would put me off. But now I actually love some fruit based bakes as long as the fruit is not done to death, doesn't turn very sour upon baking. I loved this French Apple Cake and have baked it several times now. It is buttery, with a very dense custardy texture. It is definitely dessert! Now recently I tried this cake from David Lebovitz and it turned out great as well. This cake is more of a snack cake. 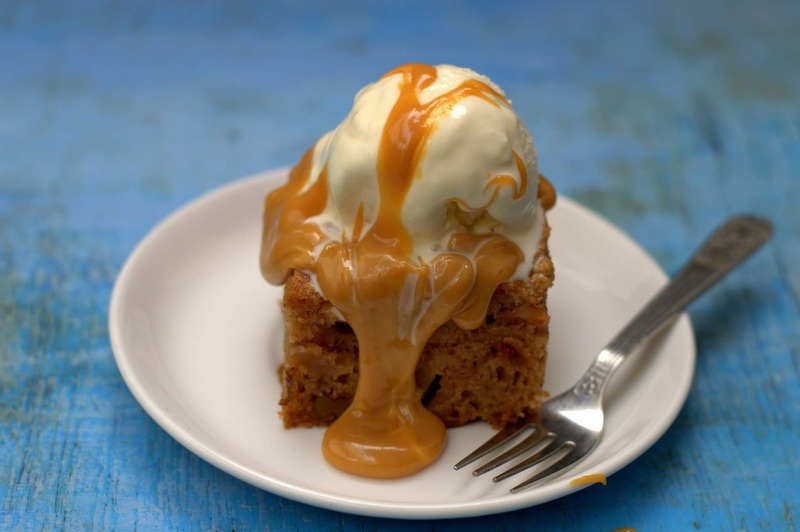 Well, nothing to stop you from topping it with a scoop of ice cream and some dulce de leche and enjoy it as dessert though! It is a lighter cake made with oil, warm spices and lots of nuts. Just the kind you would want to savor on a cold winter day. David Lebovitz makes double the below recipe in a 9'' springform tin. I have baked it in an 8'' square tin. He adds Calvados to the cake, I have used milk instead (am sure he won't be happy with this swap!) Please go ahead and use apple juice/ calvados/ whisky / rum if you like, either way you will enjoy the cake. Sift together the flour, the spices, baking soda and salt. Keep aside. In a large bow, whisk together the sugar and eggs until well combined. Whisking constantly, pour in the oil in a slow, steady stream. This will help it emulsify well. Whisk in the milk or rum. Whisk in the flour mixture until most of the flour is combined. Using a spatula, fold in the apples and the nuts. The mixture will be thick. Transfer to the prepared pan and bake for 35-40 minutes or until a toothpick inserted in the center comes out clean. Cool the cake on a cooling rack for 10 minutes and invert on the rack so that it cools with the top side facing up. Cool completely and slice. The cake is more moist a few hours after baking. Serve as is or with some whipped cream or ice cream. The cake can be stored airtight at room temperature for 2 days. Do not freeze the cake. Please note: Wash, dry, peel and cut the apples. 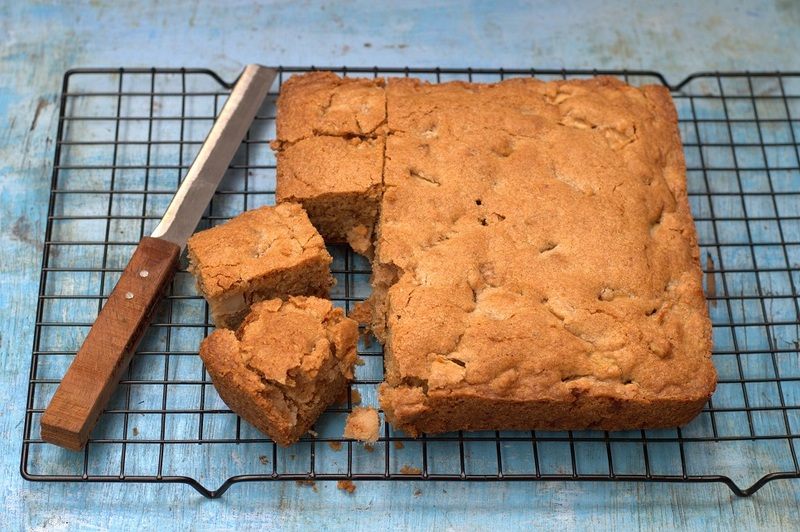 Do not wash the apples after you cut as there will be more moisture which may ruin the cake. The baking time will vary depending on your oven. If using an 8'' square tin check after 30 minutes. You can also halve this recipe and bake the cake in a muffin tray, the baking time will be less. Use good quality fresh spices. You can try using ground flax seeds instead of egg ( I haven't tried yet but should work). Mix 1 tablespoon flax seed powder with 3 tablespoons warm water and keep aside for 10 minutes until very sticky (like egg) . This replaces 1 egg. The recipe uses 1.5 eggs, so calculate accordingly and use. DISCLAIMER:*This post contains affiliate links. This means if you click on the link and buy through the link, I will earn a tiny commission on the same. I recommend products which I have used and found good or those I would consider buying myself. You will be paying the same price as mentioned on the website, there will not be any variation here. This commission will help me with me costs of running the channel and bring out more videos for you. Your support will be greatly appreciated.